My pet is splooting? Learn why and the different types of sploots. Our pets, just like our friends and family, can have some quirks. Although these quirks can give us owners a good laugh or perhaps an endearing photo, sometimes, there is a reason for these odd behaviors. More recently, one peculiar behavior is taking social media by storm: splooting. So what is splooting? In short, splooting is a type of stretch that involves kicking one or both legs behind the body. The one leg sploot involves one leg behind while the other leg remains tucked underneath. This may look familiar to dog owners, however splooting is not an exclusively canine behavior. Occasionally, cats can do it too! So is there a reason why animals sploot other than giving their owners a photo opportunity for a later social media post? 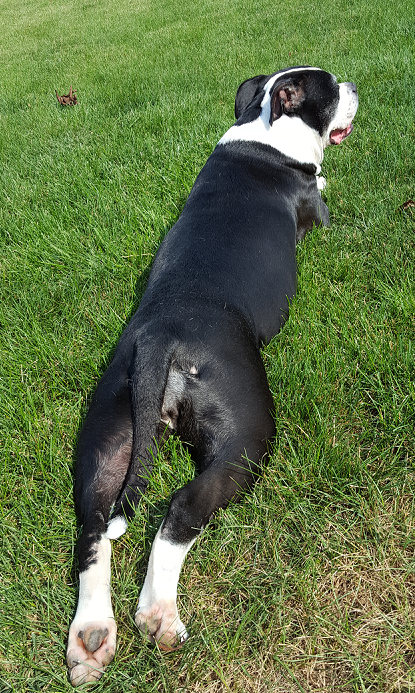 Splooting is a great stretch for the animals’ hips. Splooting also allows the animal to cool themselves by pressing their belly into the ground or against tile floors. Owners may notice that their pets sploot more often when they are younger. This is simply because younger pets have more flexibility in their hips compared to senior pets. Has your pet ever splooted? Show us by entering a photo of your pet showing off their finest sploot in our Superb Sploots contest! If your photo is chosen as our winner, we will display their photo on our GVH Facebook page. Your pet may also receive a prize!